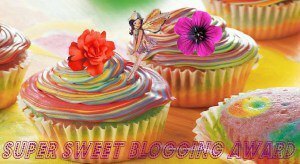 The amazing Hanne from Een nieuwe Jurk nominated me for the Super Sweet Blogging Award! Thank you Hanne! I had a speech prepared but I'm a bit too nervous! 1 – Cookies or Cake? That's a very though first question. I really can't choose. I love cookies for the instant gratification they give (without leaving you feeling like you inhaled a buffet) but I can thoroughly enjoy a well-made cake. Damn! 2 – Chocolate or Vanilla? Duh, I'm Belgian. Chocolate. All the way. 3 – Favourite Sweet Treat? It might not be the sweetest, but I have a bit of an addiction to peppermint. Seriously, I'll eat an entire bag of mints in a day if you don't stop me. 4 – When Do You Crave Sweet Things The Most? Around the afternoon, or very late at night. 5 – Sweet Nick Name? If I have one, it's a well-kept secret! Oh, this is so hard... I never know if people have been nominated already or not! I will nominate Sewciopathic, A Bouquet of Buttons, Delfinelise, Jo Sews and Rêves Mecanique!